In the world of estate planning and long term care, there are a number of ways to make sure that your affairs are handled. When we talk about “affairs,” we are not just talking about finances and assets, but also your medical care in the event that someone else needs to make medical decisions for you. There are a number of different health care directives that you can execute, including limited powers of attorney and appointing someone as your health care surrogate. Those generally put decision making power in other people’s hands (who you hopefully trust), but you can also take the power for yourself by executing directives as to your own care. One very popular directive is what is known as a do not resuscitate (DNR) order. This is a directive to health care providers that should you be in a vegetative state, or otherwise should you stop breathing on your own, providers should not make any attempts to resuscitate you. 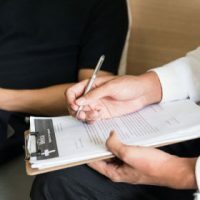 You can also combine various directives—for example, you could appoint a health care surrogate and give him or her the power to order a DNR on your behalf. Emphasizing the point was that “Not” was underlined, and the tattoo even included a signature. Doctors were perplexed at what to do. Clearly, a tattoo (even one with a tattooed signature) is not a valid DNR that allows doctors to legally allow someone to expire. A DNR must be on a certain kind of paper and signed by a physician. On the other hand, the tattoo plainly was a clearly stated intention by the man, and resuscitating him would clearly be against his wishes. That is, unless the man received the tattoo many years ago in a drunken stupor. Thus, there was no way to know whether the man actually had that wish. Making it all the more confusing, the man was homeless, found on the street, with no relatives or friends on hand to even ask. In fact, this isn’t the first time this has happened. In a 2012 incident, a man had a DNR tattoo, but admitted that he wanted to be revived and that the tattoo was a result of losing a bet. Although the doctors would have been legally able to ignore the tattoo and revive the man because the tattoo is not a legal document, doctors here opted not to rely on strict legal procedure and honored the man’s tattooed wishes. The man passed away the next morning. Although it’s unlikely many people have health care options or end of life decisions tattooed on them, the case is still a reminder about making sure that you have directives that are clear, available, and legally binding so that physicians know what your health care wishes. Make sure that your health care documents are in order and your will and estate plans are complete. Contact Tampa estate and probate attorney David Toback to discuss your estate plans.